A technique used in assisted reproductive technology to facilitate the hatching of an embryo, using a laser beam. 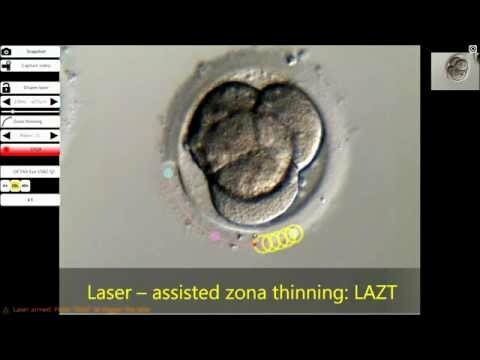 Laser assisted zona thinning (LAZT), is a technique utilizing laser beams to artificially help the embryo to hatch. The hatching process naturally occurs on the 5th or 6th day of embryo development, and involves the embryo breaking through its protective layer, called the zona pellucida (Pic. 1). This process is necessary for initiating contact of the embryo with the cells of the endometrium (inner lining of the uterus) and for its implantation into the endometrium (Pic. 2). Some embryo implantation problems in patients with recurrent implantation failure may be explained by the inability of the embryo to hatch out of its zona pellucida. This may occur naturally or hardening process can arise after vitrification (preservation of the embryo for later use). In such cases, zona pellucida can be thinned in one part using the laser technique to improve the pregnancy, implantation and delivery rates. However, a potential problem with laser AH is heating of embryo cells near the breach site in the zona pellucida. This could result in damage to the embryo cells and reduced embryo quality. The local heating depends on the beam power and laser pulse duration. However, the target in reaction process is controlled accurately and the use of laser has been shown to have no mechanical, thermal or mutagenic effect. Possible adverse effects of laser-assisted hatching include damage to the embryo by the laser beam and the heat that it generates, with associated toxicity and mutagenicity (induction of mutations) to the embryonic cells. However, these dangers are minimized by careful controlling of the target, which is the periphery of the zona pellucida, and by minimizing the duration of the laser shots. The risk of monozygotic twins is also still slightly increased, although several studies reported that it is lower than in traditional AH methods. An emerging body of evidence suggests that laser assisted hatching may improve clinical pregnancy rates, particularly in poor prognosis patients; however, there still remains considerable uncertainty. Several studies showed that laser assisted hatching does appear to offer a significantly increased chance of achieving a clinical pregnancy, especially in women with previous repeated failure or frozen-thawed embryos. However, whether laser-assisted hatching significantly improves the success rates of other several important outcomes, such as live birth and multiple pregnancy, or whether it is associated with negative consequences, such as miscarriage rates, has been still unsolved.